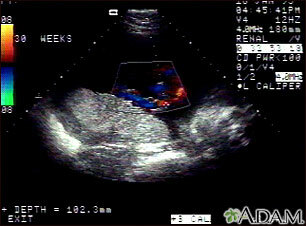 This is a normal color Doppler ultrasound of the umbilical cord performed at 30 weeks gestation. The cord is the colored area in the middle of the screen, with the different blood vessels represented by different colors. There are normally three vessels in the cord, two arteries and one vein. The umbilical cord is connected to the placenta, located in the middle left of the image.